United States Sports Academy 2002 Sport Artist of the Year Dr. Mina Papatheodorou Valyraki, upper left, and, at lower right, with FICTS Chairman Professor Franco Ascani, as featured in the Greek news media. 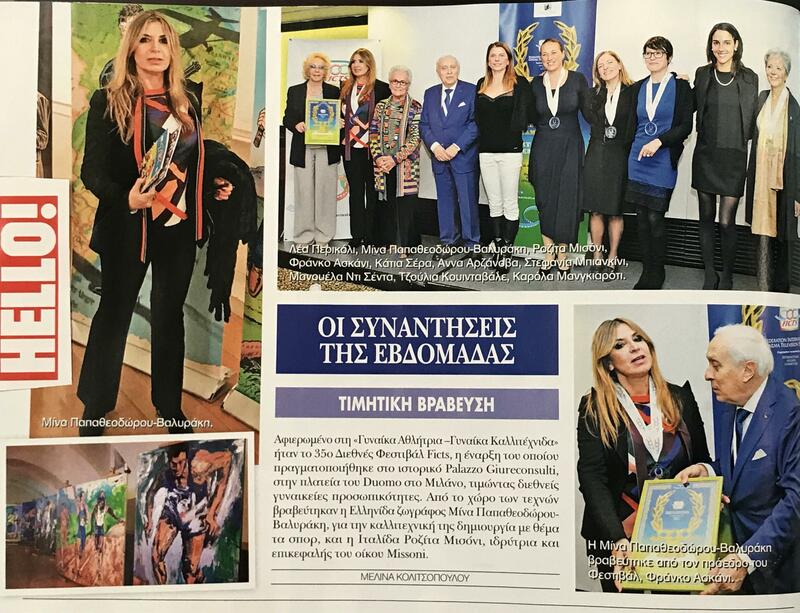 Accomplished Greek painter Dr. Mina Papatheodorou Valyraki, the United States Sports Academy’s 2002 Sport Artist of the Year, was honored with the Mention D’Honneur Award in Arts and Sport at a recent international festival in Milan, Italy, celebrating the best in creative communication to advance sport during 2017. Valyraki, who lives in Athens, Greece, was given the award by the Federation Internationale Cinema Television Sportifs (FICTS), an organization that promotes the values of sport through film and television. Headquartered in Milan, Italy, FICTS is recognized by the International Olympic Committee (IOC) for its work. It organizes the Sport Movies & TV – Milano International FICTS Fest each year. FICTS is represented by 116 member countries and chaired by Professor Franco Ascani, a member of the IOC Culture and Olympic Heritage Commission. Valyraki was the winner of the IOC’s 2014 Art and Sport Award. She has become internationally known for her ability to capture the movement of athletes and to instill in her work a sense of perpetual motion through the use of impressionist technique, vibrant color, precise lighting, and gifted brush stroke. She has not only done this with athletes, but with exotic racing automobiles, for which she has developed an international reputation and following. Her subjects, human and automotive, are said to not only to conquer the entire painting, but to exude a dynamism that extends beyond the frame. She has numerous works in the Olympic Museum in Lausanne, Switzerland, that were selected by former Olympic Committee President Juan Antonio Samaranch, a long-time admirer of her work. She was also “Honorary Artist” in Barcelona, Spain, in association with the 1992 Olympic Games. She graduated from the Supreme School of Fine Arts of the National Technical University of Athens, and then earned her Ph.D. at the University of Florence. She has done more than 60 one-woman shows around the world. 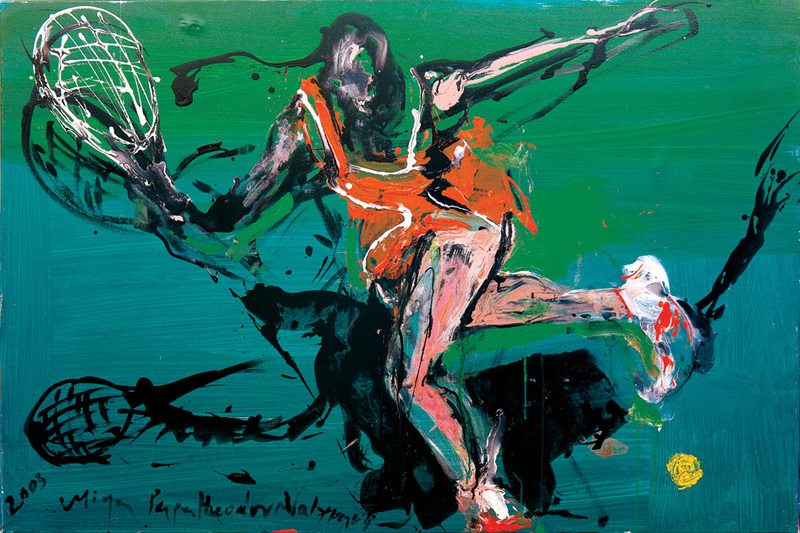 Valyraki was named the Academy’s Sport Artist of the Year in 2002 and her work is featured in the Academy’s American Sport Art Museum and Archives (ASAMA).